Who needs wine made from grapes when you can get locked on fermented strawberries? It may surprise you to know that Ireland is officially listed as a wine-producing country by the European Commission. But successful vineyards are few and far between. A number of Irish vineyards (especially in Wexford) have jumped into life over the years, with the hopes and dreams of being successful wine makers. The dream doesn’t tend to last long. Usually the weather brings the dream crashing down within a couple of years. There are exceptions, however. The Thomas Walk Vineyard in Kinsale has survived and produces a small batch of wines every year, mostly for sale into the German market. Lusca Wines are produced in North County Dublin, made from grapes grown in a series of polytunnels. However this is more of an artisan specialty product, rather than a large-scale operation. These wine makers are not alone in their efforts to defy the wet, cold weather and make Irish wine happen. In the 5th century, monks at the Cistercian monastery in Co. Kilkenny planted a vineyard. A number of other monastic communities also tried to produce wine around the same time. It seems to have ended badly, with no record after that of anyone extolling the virtues of local Kilkenny reds. Is it time to stop trying to make grapes grow where grapes won’t, and use native crops that grow well in Ireland to make wine? The answer is, yes, of course. 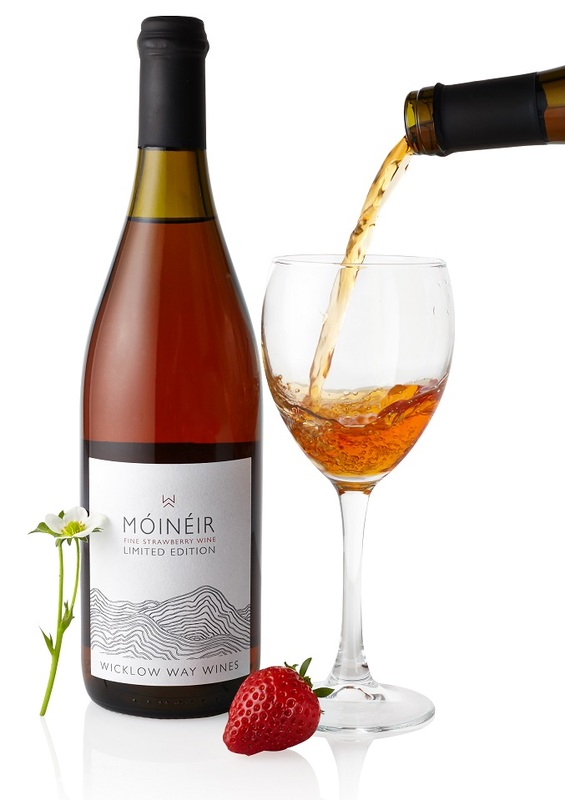 That is the philosophy behind a new wine, made from strawberries, called Móinéir Strawberry Wine (Móinéir means “meadow” in Irish). It is a product of Ireland’s first fruit winery, Wicklow Way Wines. Móinéir also make blackberry wine. Nom nom nom! 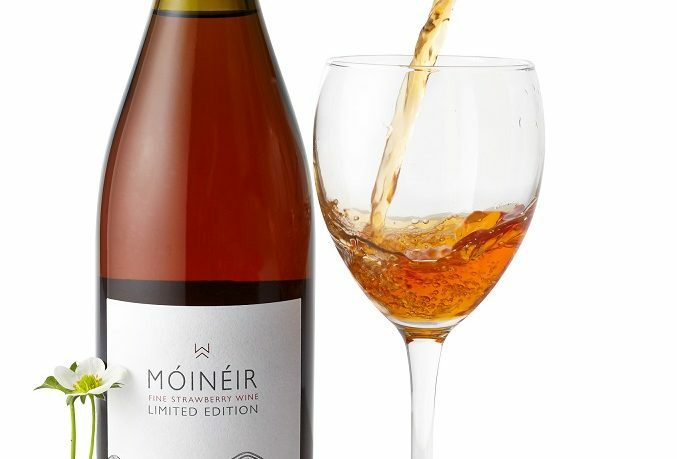 The Móinéir Strawberry Wine is created from hand-picked Irish strawberries, with around one hundred and fifty small strawberries in each bottle. They are gently pressed to yield their juices, then fermented over a number of weeks, and aged to a golden-red hue. Elderberries are a native Irish plant, growing happily in meadows and hedgerows and often inhabiting areas that are quite inaccessible. 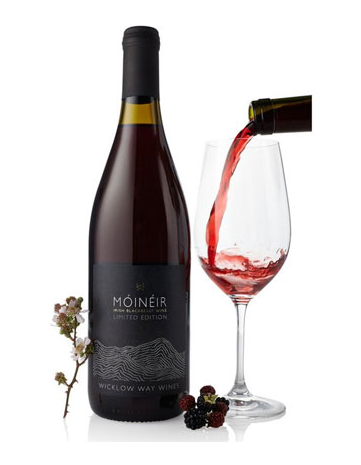 The wild elderberries foraged around the Wicklow Mountains are blended with Irish blackberries to make the Móinéir Blackberry Wine with Wild Elderberries. Curious to taste this fruit wine? Of course you are! These wines are available for purchase in restaurants and from wine vendors around the country. Or you can buy directly from the “vineyard.” Log onto wicklowwaywines.ie/shop.